Do you currently suffer from digestive issues or you feel your digestive system doesn’t work quite as well as it should? Maybe you have a hunch that something is not quite right down there. You are definitely not the only one. Many people suffer from various digestive issues which come with other symptoms as well. But there is a solution to this – improving your gut health! In this guide, you will learn everything you need to know about gut health and what you should do to improve it. But first of all, let’s have a look at why all this actually matters..
Why is it important to have a healthy gut? Having a healthy gut is very important as healthy gut contributes towards your general health and wellbeing and keeps your immune system strong. Hippocrates said: “All Disease Begins in The Gut” and he was very right. Around 70% of the immune system lives in the gut and when your gut is not in the top condition, your immune system isn’t either. This means that you are more prone to colds, flu and various illnesses but luckily you can change that – you can boost your immune system by looking at improving your gut health as a priority. To keep your gut healthy there are many things you can do, from eating the right kind of foods to improving your lifestyle. One of the key things to do to improve your gut flora or so-called gut microbiome is to increase the number of good bacteria (probiotics) you consume daily. When your gut is not in optimal health you may experience a variety of symptoms such as bloating, gas, skin problems and even depression. Yes, unhealthy gut is linked even to depression! Your gut microbiota is where all your food is digested and nutrients extracted. It serves as a protective barrier against intestinal infections, and produces vitamin K, which helps make blood-clotting proteins (source). This is another reason why it’s important to have a healthy gut. When good and bad bacteria in your gut are not balanced, you will not only experience a variety of symptoms (some of them mentioned above), over time you may be even diagnosed with autoimmune conditions such as IBS and Rheumatoid arthritis (some of them may not seem related to gut health but there is no doubt gut microbiome plays a significant role in the mediation of autoimmune disorders). So what exactly affects your gut health? It’s not all about the food, there are other factors in play as well. Research shows that ongoing stress can negatively affect the trillions of healthy bacteria in your gut, and subpar gut health can have a depressing effect on your entire system (source). If you want to improve your gut health, the first step would be to test yourself for food intolerances. It could be that all your digestive issues are coming from certain types of food which you are intolerant to or even allergic. Do you ever get stomach issues after eating a particular type of food? Bloating, gas, pain in your stomach? It could be that symptoms come the next day and you struggle to identify the offending foods yourself. That’s why food intolerance test can be so helpful. Go ahead and get yourself tested to see what you discover. 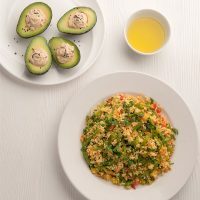 Eliminating certain types of foods from your diet which they don’t agree with you will be better for your gut health and a good start towards a better general health. The next thing you may want to do is get your gut microbiome tested to see how healthy your gut actually is. Microbiome testing can uncover the bacteria that you are missing in your gut flora and the test can actually stop you from guessing what type of probiotics you should supplement with (or add to your diet). I have personally done the microbiome testing myself at home and I’ve used Thryve for that (they sent me a free test for me to try and review on my blog). 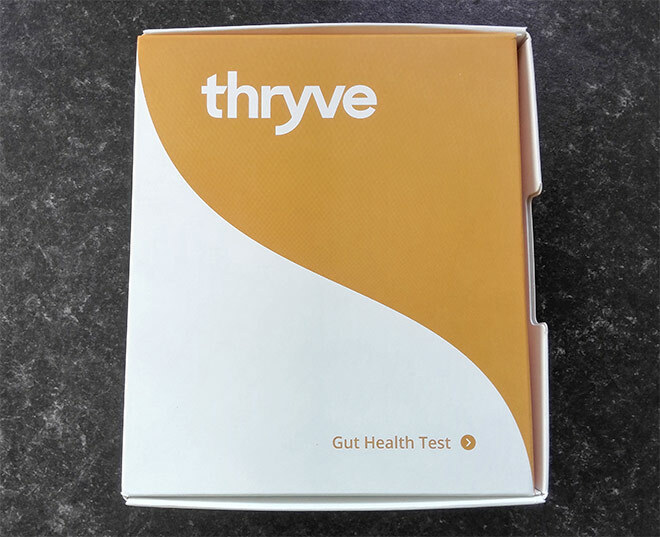 Thryve is the world’s first Gut Health program that incorporates both Gut Microbiome Testing and Personalized Probiotics. They also give you diet recommendations based on your results to make improving your gut health much easier for you. Thryve are based in the USA but their microbiome testing kit doesn’t take too long to arrive in the UK. Thryve is the realization of many long years of research and partnerships with MIT and Stanford. 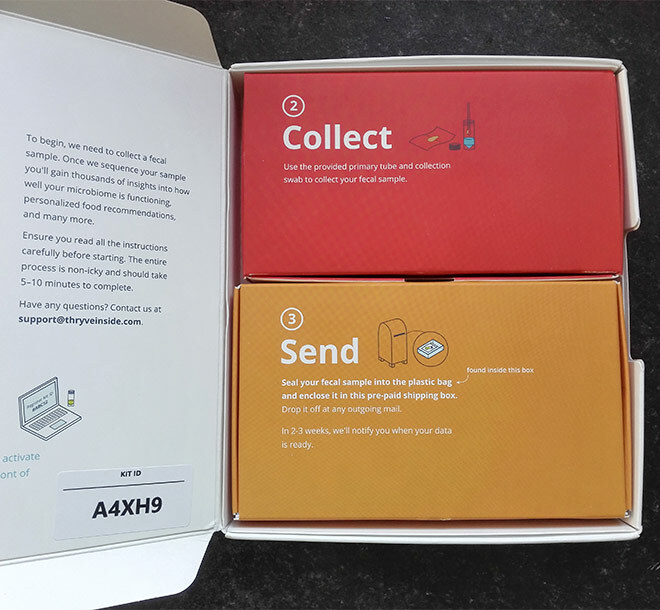 The microbiome testing kit from Thryve contains all the instructions you need to perform the test correctly and the collection of the sample is not complicated at all – it’s really easy actually, just a bit gross. Once you have your sample ready, you just send it off in the provided plastic bag and box. You have to pay for the postage yourself but that is refunded to you once you send them a picture of the receipt. It’s quite nice that they send you a confirmation email to say that they received your sample. The analysis of the sample takes a few weeks and you then receive another email to say your results are ready. Logging in to their website will explain your results to you and highlight what type of good bacteria you are missing or you should supplement with. This is really good because it means you don’t have to guess what you should supplement with. 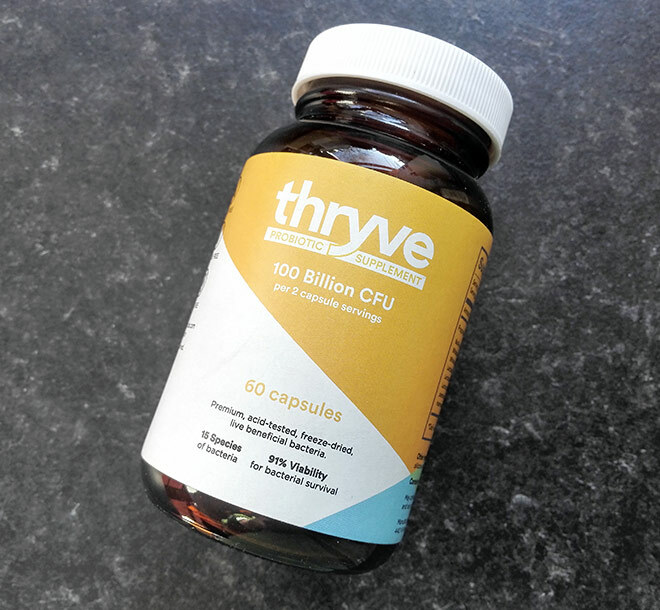 Thryve don’t only offer recommendations based on your diet but they can also create a personalised probiotic blend for you, based on your current gut health and general health. This is what’s really great about them and this is what distinguishes them from other similar companies. Only once you get your microbiome tested you will know what your body needs. Otherwise, it’s just a guess game. You could go ahead and buy some probiotics supplements which you may think they will work for you but you could be throwing your money away without even knowing. Once you have dealt with all the lifestyle factors (smoking, drinking, stress) and got your microbiome tested, the next stage would be to look at adding some additional probiotics to your diet. You may be already getting some good bacteria through your diet but maybe it’s not enough and you still experience certain symptoms. The first thing you could do is try and add more probiotic-rich foods to your diet; another option is to supplement with probiotics capsules (personalised probiotics blend is better). For many people, it may be easier to supplement especially for those who have little time to think about the food they eat every day (busy parents and hard-working people!). When you make sure your body consumes enough probiotics, you are making your tummy happier. But how exactly? Our digestive tract needs a healthy balance between the good and bad bacteria and consuming enough probiotics (good bacteria) maintains that balance – probiotics contribute towards healthy movements of the digestive system and help to maintain gut barrier function. Not all probiotic preparations are the same. You will want to buy something that is effective and something that works. When buying a probiotic supplement you should always go for the best quality as otherwise you will be just throwing your money away. And the best is not the cheapest of course but it’s worth investing if you care about your health. You will find many probiotics supplements on the market today and it can be quite confusing to know which one is the best. There are probiotic supplements out there containing a specific type of bacteria and there are those which contain different strains of probiotic bacteria. Dr. David William states that it’s actually not the total number of bacteria in a product that is most important; it’s the number of different strains of bacteria it includes. He also explains that “multiple strains tend to be more effective overall than products containing an extremely high concentration of just one or two strains”. The most important bacteria which a good probiotic supplement should contain are as follows: L. acidophilus, B. longum and B. bifidum. Another important thing to know when buying probiotic supplements is how they are going to be delivered to you. The good bacteria is sensitive to heat and light and when you receive your probiotic supplement you would expect a live bacteria in it, not dead, right? I actually got sent a bottle of probiotics all the way from America (from Thyrve) and I was amazed at how well they protected that valuable bottle. It came in a quite big box (for the size of the bottle), wrapped in lots of protective packaging but not only that, it was wrapped in a special material with cold packs next to it to keep the bottle cool throughout the journey. The bottle was still cold when I took it out of the packaging so their system no doubt works very well. Not sure if all the companies take such a great care when packaging and delivering their products. It’s just something to keep in mind. As mentioned above, probiotics are very sensitive bacteria and to get them to intestines alive, manufacturers need to make sure the supplement is made in a special way. Once digested, the supplement should bypass stomach acids without killing the good bacteria off (yes, stomach acid can kill probiotic supplements). The best is if the probiotic supplement has a special protective coating which enables probiotics to get into intestine alive. Finally, you should consider going for a personalised probiotic formula, something that it will be very specific to you and it wouldn’t work the same for everybody. Personalised probiotics are different than the rest and are customised to your unique biology. That’s why they would work better for you than any other types of probiotics. So if you want the best this is it. I recommend trying Thryve personalised probiotics together with their gut microbiome testing. I may be a little bit biased as they are the ones I’ve used but they are seriously good, meeting all the requirements of a good probiotic. If you are interested in trying them, you can get a 15% discount using a code behealthynow15. Not bad, right? So if you want to improve your gut health, it’s not as simple as you may think. First of all, you need to look at your lifestyle and see what changes you can make there. Secondly, you have to identify whether you are intolerant to any foods. And finally, get your gut microbiome tested to see where you stand and what bacteria you would benefit from. You are likely going to need additional probiotics in your body and if you decide to supplement, make sure you buy the best you can – go for personalised probiotics supplements to make sure they are definitely going to work for you. I recommend trying Thryve personalised probiotics as you can get 15% discount by using a code behealthynow15. Do you currently take probiotics and have you ever considered trying personalised probiotics? An interesting post. There’s a lot of stuff about probiotics and skin as well. The microbiome can have a part to play in eczema and psoriasis flares. Great post! I find that probiotic supplements make a big difference for me. I like the sound of the Thryve ones you mentioned. Enjoyed reading! It always amazes me how vital probiotics are for our health. Thanks for the tips for choosing a high-quality product. A lot of useful information. I’ll definitely take them into consideration next time I choose a probiotic supplement. Great blog! At Amchara Health Retreats we focus a lot on gut health with our clients, and we really think that is something more people should be working on so it is great to see this and hopefully get people thinking. I’ve always had a problem with my digestive system and I’m not that fond of yogurts. Maybe I should try this one and see how it works 🙂 Thank you so much for sharing this.